A Real Workout: The Stamina|X Air Rower is for the person who is willing to take their workout and their fitness to the extreme. Trainers widely recommend incorporating a rowing machine into your high intensity workouts. Rowing workouts are great for increasing your cardiovascular fitness and strengthening your whole body. During a HIIT session, it is important to have both cardiovascular and strength elements to get the full benefit of your workout. The Stamina X Air Rower is the solution for the cardio needs in many popular programs. Why spend the money and fight the crowds at the gym when you can bring the same elements of a commercial rower into your home at an affordable price? Durable Construction: Pushing your body to new levels requires you to be tough and durable. 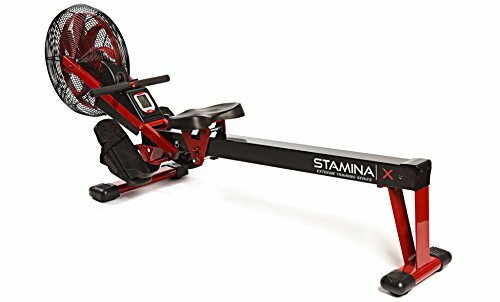 Stamina's engineers have designed the Stamina|X Air Rower to be just like you, tough and durable. The steel frame will hold strong during your hardest of workouts. The rowing chain keeps the air resistance coming as the fan spins inside the metal housing, automatically adjusting the resistance to your intensity. The molded seat allows you to push your workouts longer and longer while not being limited by sitting on an uncomfortable seat. You'll know that you're making progress with the real time feedback from the multi-function monitor in key measurements - distance, calories burned, speed, time, number of strokes, and strokes per minute. Fits your space: You don't need a dedicated home gym to have the convenience of getting a great workout at home. The Stamina|X Air Rower can be easily folded and rolled away into a corner or closet. Since this rower is painted with the Stamina|X red and black, we won't blame you if you want to leave it out for your friends to see.